HP is pitching the Pre 3 not as a successor to the Pre series of smartphones, but rather as the phone for the professional that wants a powerful business device that can also do personal stuff. While the Pre 3 does maintain many of the lines of its Palm Pre ancestors (if does resemble the steroid-pumping offspring of an original Pre and a Pre 2), it does it all in a taller but slimmer package with internals that put the original Pre to shame. Inside you’ll find a blazing fast 1.4GHz processor, and around front is a 3.58-inch 480x800 display - the largest and highest resolution of any webOS smartphone. The Pre 3 is also compatible with HP’s new Touch-to-Share technology that allows owners of an HP TouchPad to easily transfer information between the two devices just by touching the two together. 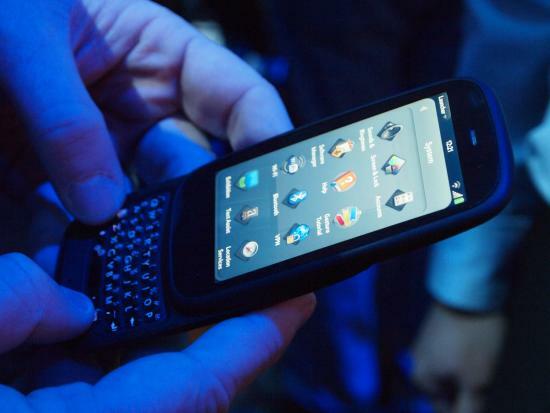 In the Pre tradition, the Pre 3 (stylized as Pre3) is a portrait slider smartphone with a full QWERTY keyboard; in fact it’s the largest of any webOS phone. Considering that this is the largest webOS phone to date, that’s no surprise. The Pre 3 also has the largest screen of any webOS device, a full 3.58-inches across. For reference, that’s just a smidge larger than the screen on an iPhone, and notably larger than the 3.1-inch screen on older Pre series devices. That screen is also packs more pixels than any previous webOS device, at 480 across and 800 tall, the same resolution as many high-end Android phones, like the HTC Evo 4G, though in smaller size. The Pre 3 has the sharpest screen of any Palm device, clocking in at a squint-worthy 260 pixels-per-inch. That gorgeous screen isn’t everything, as the Pre 3’s internals are also mighty impressive. The beating heart of this phone is a Qualcomm Snapdragon processor that runs at a blisteringly fast 1.4GHz. It’s a single core affair, but at that speed it’ll get plenty done in a hurry. Like the Veer, the Pre 3 includes 512MB of memory, but as we’ve seen before, that is plenty for a smartphone of this day and age. Customers will have the option of 8GB or 16GB for storage, though as with all webOS devices, that storage is simply not expandable. The Pre 3 includes the typical pack of sensors, and adds a compass to the webOS mix. 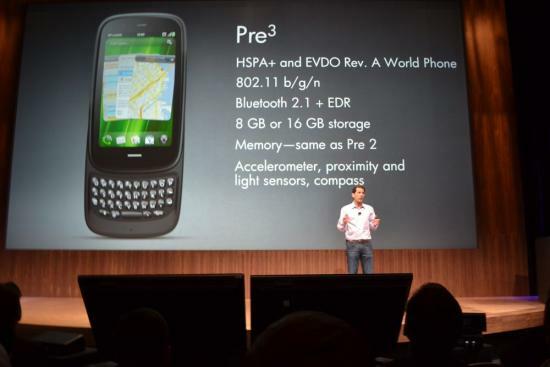 The Pre 3 is also the first webOS phone to include an autofocus camera. It’s just a 5 megapixel unit, in a world where more and more phones are headed the 8MP route, but if 5MP gives us a better quality picture, we’re fine with that. Quality of quantity, as they say. That camera will be capable of shooting HD video (we’re assuming 720p and not full 1080p HD) with some sort of unexplained video stabilization voodoo (software or hardware, we’re not sure). The Pre 3 is also the first webOS phone with a front-facing camera, this one of the VGA variety, to be used for video calls. And to make sure those calls sound their best, the Pre 3 does have dual noise-cancelling microphones - one at the bottom of the slider, and another high on the back to pick up and isolate ambient noise. Wi-Fi b/g/n, Bluetooth 2.1, and aGPS round out the standard radio mix. As announced, the Pre 3 will be available in two cellular varieties: as an HSPA+ GSM phone, or as a CDMA Rev A world phone. HP didn’t provide any specifications on which GSM bands the Pre 3’s radios will run on, but if we had to take a guess we’d shoot for the fat middle with the standard AT&T and European bands over T-Mobile’s strange 3G bands. The CDMA world phone is also a first for webOS, and if you’re not familiar, here’s a brief overview: a CDMA world phone includes a 3G EvDO radio (in this case the faster EvDO Rev A) along with a GSM radio for use outside the United States. There are a handful of CDMA world phones available in BlackBerry and Android form on Verizon and Sprint, and they appeal very strongly to international business types and globetrotters like us. Size-wise, the Pre 3 is taller and wider than the older Pre series phones, measuring 111 mm tall and 64 mm wide (compared to 100.5 mm and 59.5 mm for the original Pre). It is a touch slimmer, at 16 mm thick against to the Pre’s 16.95 mm. That is rather thick for a modern smartphone, but most modern smartphones are simple slabs and don’t include a slide-out QWERTY keyboard like the Pre 3 (though it is still a bit thicker than the Samsung Epic 4G and HTC Evo Shift 4G, both QWERTY slider smartphones). Compared to the announced-at-the-same-time HP Veer, the Pre 3 is positively gargantuan. Like the Veer (due out a few months earlier), the Pre 3 will ship with HP webOS 2.1, unless Palm decides to move things up a bit. webOS 2.1 includes features like voice dialing, Exhibition, Flash 10.1, and plenty more. Unique to the Pre 3, at least when it launches, will be the integration of a new Touch-to-Share technology. Touch-to-Share currently works with just the HP TouchPad tablet, and will allow the two devices to exchange information by just touching them together. The exchange is done via a “communication coil” in each device, one in the back of the Pre 3 and another at the base of the TouchPad. Press the two together and the information is exchanged. We’re still a little fuzzy on how exactly it all works behind the scenes, though our assumption is that whichever device was most recently in use will be assumed to be the sender by both. HP has only demoed Touch-to-share sending a website URL from the TouchPad to the Pre 3, automatically launching the web browser and loading that page, but we can see it being used for much more, including transferring reading content from the Pre 3 to the larger-screened TouchPad or sending map data from the TouchPad to the Pre 3 for being out on the go. By announcing the Pre 3 in both GSM and CDMA varieties, and not including any GSM frequencies, we can safely say that the Pre 3 could appear on any network on the planet (with the possible exception of North Korea). Considering, however, the fact that CDMA was even mentioned, we’d wager that Sprint and/or Verizon are likely candidates for carrying the device. When the Pre 3 is made available, pricing is anybody’s guess, though as with most top-tier smartphones we wouldn’t expect it to be much more than $200 on contract. Off contract is anybody’s guess. When the Pre 3 will be available is another big unknown. HP says the Pre 3 has “planned availability this summer,” so sometime between June and August, and that’s assuming that things go as “planned.” So while the Pre 3 may be the only 1.4GHz smartphone announce, by the time it finally comes out it will likely have plenty of company. If you’re feeling a wave of déjà vu, we’ll confirm for you that yes, this is plenty reminiscent of the original Palm Pre launch, though so far without much of the hype.